Great insights into applying skills such as planning, delegation, follow through, coaching, mentoring, trust, communication, decision making, praise and recognition. What’s even more important to realize here is that the game in constantly changing every time your troop gains or loses a Scout (or even an Asst. Scoutmaster). The group dynamics are in a continual cycle of Forming, Norming, Storming and sometimes Performing (which concepts are also summarized in this book and covered in much greater detail during Wood Badge). Working the Patrol Method is very well written, easy to read and includes many real stories that illustrate the points these authors are making. If there is any other book you read to understand how this program should work (other than the Scoutmaster Handbook), you really should read this one! 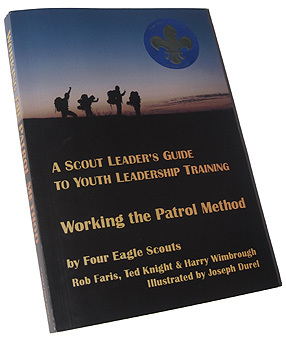 For more information about this book or to get a copy, visit ScoutLeadership.com. This entry was posted in Books, Leading by Example and tagged adult leaders, boy scouts, handbook, leadership training, leading by example, new leader essentials, patrol leaders, patrol method, scout leadership, scouting, scoutmasters, youth leaders. Bookmark the permalink.